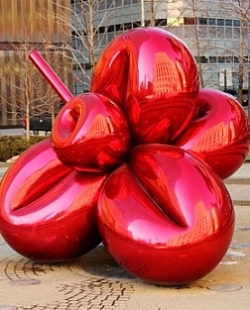 A public sculpture I don’t like is Jeff Koons, Balloon Flower (Red) outside 7 World Trade Center in New York. Between 1994 and 1999, Jeff Koons started to flood the world with his ‘celebration series’, stainless steel flower sculptures in yellow, red, blue and orange. Here is the red version, but the colour actually does not matter: I do not like any of them. The particularity of this one though, is the context. The sculpture stands in a triangular square near 7 World Trade Center, a skyscraper in Lower Manhattan’s financial district, its name refers to the first building, the World Trade Center destroyed by the 9/11 terrorist attacks. In famous Koons’s style, the flowers are supposed to refer to balloons at children’s party and, one can surmise, allude to fun and frivolity expressed in the ultimate pop gesture, which is his specialism. To me, however, the sculpture does not sit well here. There is nothing site-specific about it – a shame when considering a place with such a strong history. Not that I would necessarily want to see a dramatic sculpture, but one commissioned especially for the site would seem more appropriate than this theme park image.